Alicia did you always have a love of flowers? AB: Both my parents are keen gardeners, so I grew up being outside and surrounded by flowers. I think a love of nature was definitely installed in me at a young age. However, it wasn't until I had my first job at a PR company where I was exposed to floristry and my true love for the trade grew from there. Tell us more about your training. AB. I trained for two years at a local college and received my diploma with honors in floristry there. From here I went to train at Jane Packer School of Flowers and later at McQueens. I am constantly learning and looking for new inspiration, so my training is still very much on going even today. Do you think a college course is the right path to take to get into floristry? AB: I think when I trained options were more limited. It was a commitment, two days a week for two years. You had to provide your own flowers and I had to juggle work around those days. I think it's really important to get a good foundation in floristry before you go on to develop your own style and that is what the course provided me. But looking back if there had been the option to do an intensive course, that would have definitely suited my lifestyle better. Tell us about your style of floristry. AB: My style is constantly evolving. I love the garden and natural look. Flower movement is very important to me. To me floristry or flower arranging should be like looking at a piece of art. I try and bring that to life by combining colours and textures that make free flowing beautiful displays. AB: Nature, fashion, interiors and art influence my work. 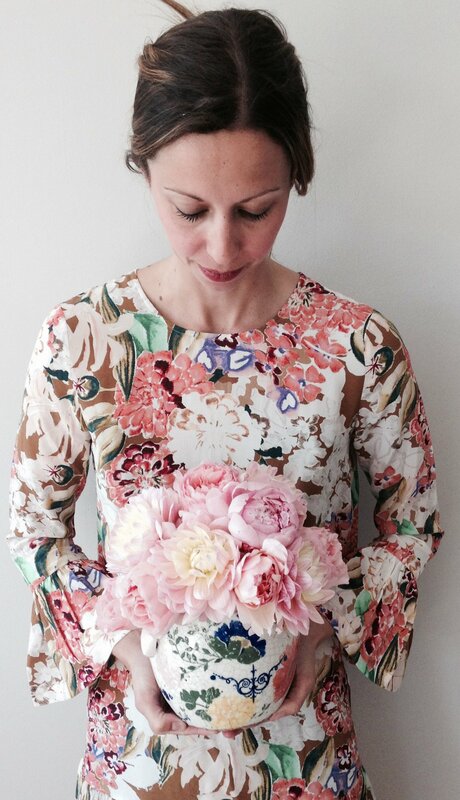 Tell us how Flourish Sussex Flower School came to be. AB: I ran a wedding flower and event business for eight years. After taking some time out to have my three children, teaching floristry seemed like a natural progression and it is something that I have fallen in love with. We have created classes and courses that run over a period of three days, to one day a week and even half days, so they are perfect for people who are very busy and can't commit to a two year course. At Flourish a student can build up their own individual training programme, to target areas in floristry that they want to concentrate on, at times that are convenient for them. It's not just for people entering floristry though? No not at all. There are classes, such as 'Posy's and Prosecco' that offer an opportunity for anyone that loves to be creative to come along and learn how to create a hand tied posy and have a few glasses for bubbles! It's a great class to meet people, come with some friends, a hen party or give as a birthday present. But there are loads of half day classes and whole days that are ideal for anyone that has no experience and that simply loves flowers. Long term what are your plans for Flourish? AB: Oh gosh I have lots of ideas! My hope is to just keep meeting new people and hopefully inspiring others to get into flower designing. We are also going to be launching an online shop in 2018 with lots of vases and decorative goodies, plus floristry essentials, so watch this space! Lastly I have to ask what is your favourite flower? It's a hard question, there are so many. But I think for me nothing quite matches up to a Peony, then an English rose and ranunculus are close behind.